What is the thing that makes you maddest about politics in America today? Which one of the following two categories would you say that thing falls under? • Are you mad about the dysfunction as a whole? • Or, are you mad about how the select few issue(s) you deeply care about are constantly under attack and seem to have little hope of ever being resolved? The bad news is this. Regardless of which category your concern is in, the political system America is using now will not solve your problem. The current system will only allow the dysfunction to get worse. The current system will continue to see saw up and down on the issues you care about. Do you want to stop having to be mad? Do you want to have your issue(s) resolved? If your answer is yes, then this DVD has the very simple solutions you’ve been looking for. 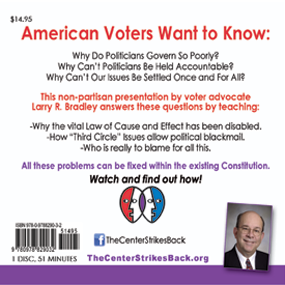 This DVD tells you what the electoral system changes you should be demanding first as a voter are and why you should be demanding them. Once you have those demands met, then your problems can be resolved. 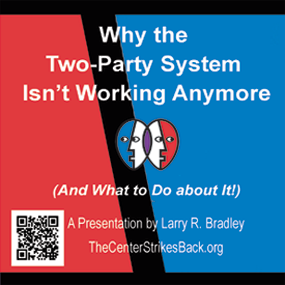 The system will function again and that functioning system, one way or the other, will resolve the festering problems that have hampered our progress for decades. Hint: The solutions are not term limits, Constitutional Amendments or Constitutional Conventions. Those are just smoke screens meant to obscure the real solutions. Like to know more? Check out the DVD Cover below. We also have a sample you can watch on YouTube. Join us in bringing efficiency and effectiveness back to politics and government. Order today. You’ll be glad you did.